These Schöne Hair Cutting and Thinning Scissors are made of ice tempered Japanese stainless steel which ensures superior durability and maximum longevity. Hair cutting scissors have razor edge convex hollow ground blades, but hair thinning shears have two kinds of blades – one of them is razor edge convex hollow ground blade, but other is 28 micro-teeth blade which ensure razor-sharp, precise, fast and easy cuts. Both of them are 6.5 inches long, but their blades are 3 inches long. The total weight of this Schöne set is 7.2 ounces. Both of them have tension adjustment screw which allows to set desired cutting tension. These hair cutting shears have curved ergonomic finger rest, but unfortunately it cannot be removed, if it is needed. They come with blue rubber finger sizing rings which not only improve comfort, but also stability and precision of cutting. Other features of these Schöne hair cutting shears are crane handle which improves ergonomics and thus comfort, as well as cushioned stopper or silencer which ensures stable and silent cutting. This set includes one pair of hair cutting scissors, one pair of hair thinning shears, light brown leather cleaning cloth, black plastic grooming comb, as well as black synthetic leather case with zipper. As these Schöne hair cutting and thinning shears are made of ice tempered Japanese stainless steel which has silver color and metallic sheen, their appearance can be described as polished silver. Their rubber finger sizing rings are blue. These scissors have crane handle with curved shin which means that their finger rings are not symmetric, therefore, it can be said that these hair shears are designed to cut the hair comfortably and smoothly, without causing any distress to hands and fingers. In the area of tension adjustment screw they have Schöne name. Considering that these Schöne hair cutting scissors and hair thinning shears have all of necessary qualities, as well as their price is affordable, they can be used both for professional and amateurish purposes, namely, they are suitable for usage in hair salons and at home. As this set includes both hair cutting and hair thinning shears, owner of this set can cut and thin the hair. These hair cutting and hair thinning scissors from Schöne are made of ice tempered Japanese stainless steel. Hair cutting shears have razor edge convex hollow ground blades, but hair thinning scissors have convex hollow ground and 28 micro-teeth blades. Both of them are 6.5 inches long, but the total weight of this set is 7.2 ounces. As they are made of stainless steel, they are silver color with metallic sheen. They have crane handle with curved shin and blue rubber finger sizing rings. These Schöne hair shears have tension adjustment screw, non-removable finger rest, cushioned stopper or silencer, as well as removable finger inserts for finger holes. 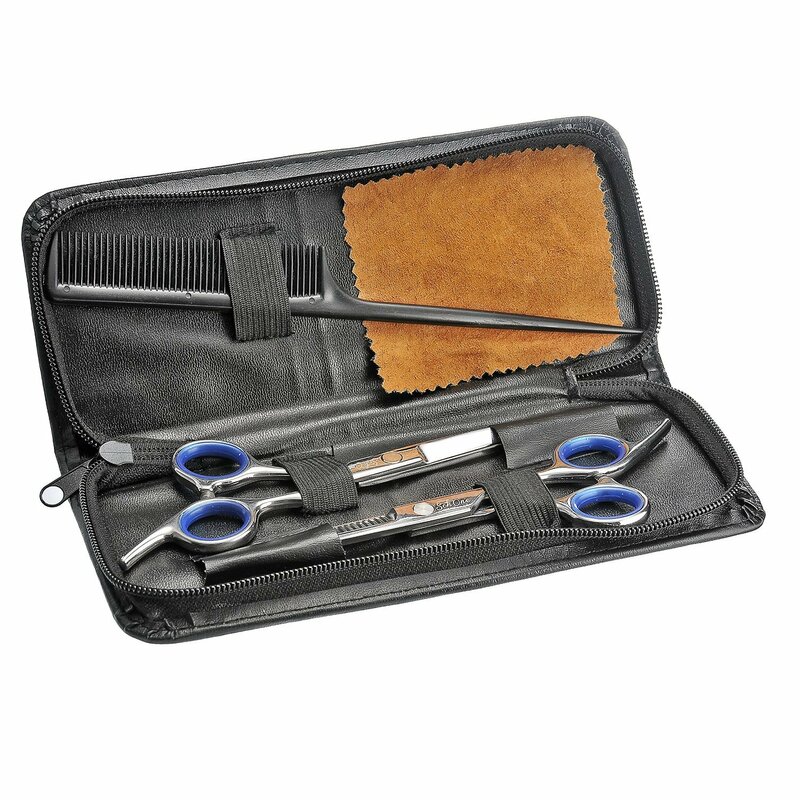 This Schöne set includes hair cutting scissors, hair thinning shears, leather cleaning cloth, grooming comb and synthetic leather storage case. This product is suitable both for hairdressing professionals and students.